Bollywood celebrities have been congratulating top filmmaker Karan Johar on becoming a father. 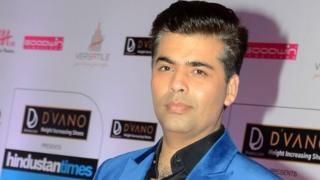 Johar, who is believed to be gay, announced the birth of his twins through a surrogate on Sunday. The director said in a statement that it was an "emotional but "well thought-out" decision. Homosexuality is illegal in India, and individuals becoming parents through surrogacy, although legal, is not very common. Bollywood superstar Shah Rukh Khan's son Abram was also born through surrogacy in 2013. Top stars, including Alia Bhatt and Priyanka Chopra, were among the first to congratulate the director. Many people have also congratulated Johar for taking the "bold decision" to become a single parent. Johar has never spoken publicly about being gay, but he recently wrote in his autobiography that everybody knew "what his sexual orientation was, and he didn't need to scream it out". "The reason I don't say it out aloud is simply that I don't want to be dealing with the FIRs [first information reports, or police complaints]. I'm very sorry. I have a job, I have a commitment to my company, to my people who work for me; there are over a hundred people that I'm answerable to," he wrote. Commercial surrogacy, including for single parents, is currently legal, but a draft bill plans to limit it to childless couples who have been married for at least five years.